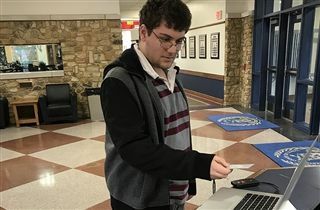 When senior Wesley Moss saw the long line of students waiting at Ms. Austin’s desk to sign out, he knew there had to be a way to speed up the process. Inspired to find a better solution, Wesley created a way for seniors to sign in and out using their lanyards and an electronic scanner. After much brainstorming and figuring out what he would need, Wesley met with his computer science teacher, Brian Wagner, to get the process started. Wesley wrote the code for the program, and Mr. Wagner helped him secure the scanner and other materials. Once Wesley completed the project, he got the stamp of approval from Upper School Director Kent Martin, and his idea became a valuable tool for his peers and the Upper School in general. Julie Austin, the upper school division assistant, said that the students have really enjoyed using the scanner and that it’s a much more efficient way to conduct the sign out process.